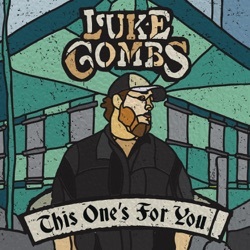 This One's for You is the debut studio album by Luke Combs, released by River House Artists from Sony Music Entertainment on June 2, 2017. A collection of 12 songs that expertly mixes Nineties country with modern flair. Combs shows a lot of potential with this album but for me he would benefit by stripping it back a bit more to let his voice strike an emotional connection with the listener. I want more from Luke Combs because I know he has it in him. The tension between Combs' traditional side and his modern inclinations is what gives This One's for You some freshness and it surfaces often. This One's For You is sure to establish the newcomer as one of country's most promising new acts. Luke Combs’ impressive debut album goes for broke from first song, Out There, right through to closer, Honky Tonk Highway. Even with so many personalities working on a single album, all the songs flow together and establish Combs as one of the more traditional major-label artists in the genre. Two tracks in, and you realize that Luke Combs is a keeper. The singer and songwriter proves himself to be an astute student of both the genre's trends and conventions.